1. For the dough, sieve flour and salt together. Mix oil using hands. Add little water at a time and knead into a medium soft dough. 2. For filling, mix paneer with green chilies, coriander, cumin seeds, garam masala powder, salt and red chilies. 3. Divide the dough into small balls of equal portions. Roll each ball into a shape of small round roti (puri). 4. Now spread the paneer filling in the middle and seal the edges nicely (closing in forming a pouch). 5. 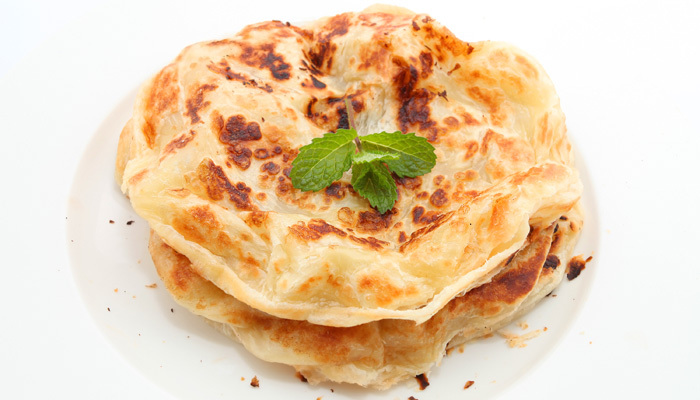 Apply a little dry flour and roll it into a round full-sized paratha. 6. Greasing both sides with ghee, cook until both sides turn golden brown and paratha is cooked.